Hi Bruce, We are about to launch the Atlantic 50 in the next couple of weeks. Each STUDY PLAN contains ALL the construction drawings for each material - STEEL or ALUMINUM as applicable to the particular boat plan - with up to 25 sheets per plan! Lists of materials - Technical information - Numerous construction drawings are all included. 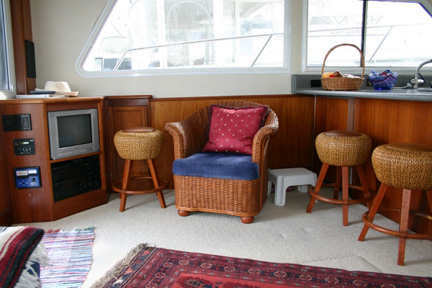 SPECIAL INTRODUCTORY OFFER: COMPLETE BOAT PLANS & CUTTING FILES ... Delivered by DOWNLOAD to your computer within 12 hours of you placing your order. 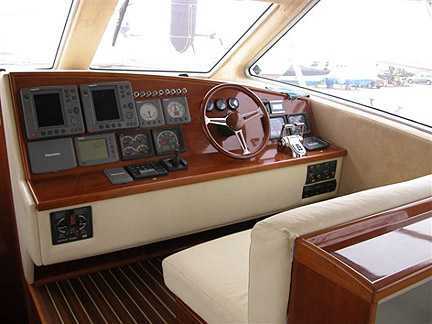 The plans have all the information you need to build your own boat.. Each plan contains all the construction drawings for STEEL OR ALUMINUM construction, plus bonus drawings covering electrical, plumbing and engineering, everything you need to build your boat. LOA ... 15.24 m / 50'-0"
LWL 13.97 m / 45'-10"
Beam 4.60 m / 15'-09" Draft........1.00 M / 3'-03"
STEEL or ALUMINUM versions - Speeds to 30 Knots. The underwater view reveals our proven moderate V sections which combine good handling and performance with a comfortable ride. 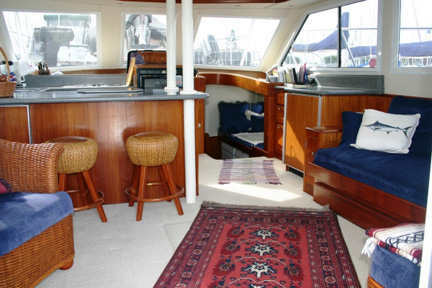 Here we see the layout chosen by the first client for this new boat - you can customize the interior to suit your needs. The photos shown here are taken looking forward in the interior of the salon in the fiberglass version of this design. 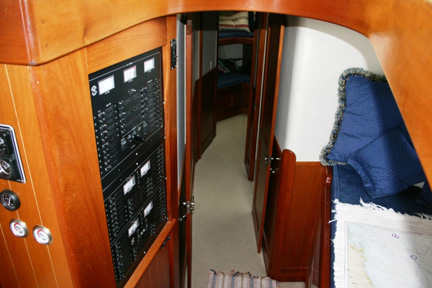 The photo shown here is of the port side of the salon of the fiberglass version of this design. LINKS TO OTHER SPORT FISHERMAN THAT YOU CAN BUILD. 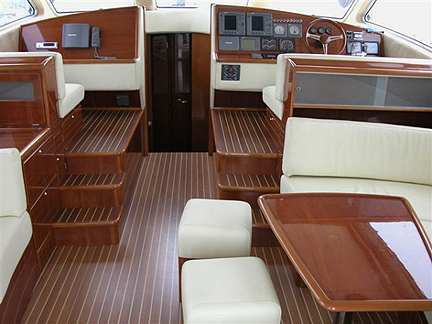 The photo shown here is of the interior of the fiberglass version of this design. 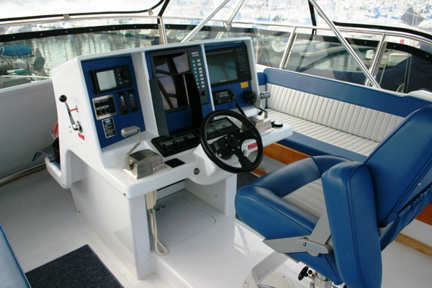 Atlantic Command station shown here can be used in several of our Atlantic and Euro motor yacht designs. 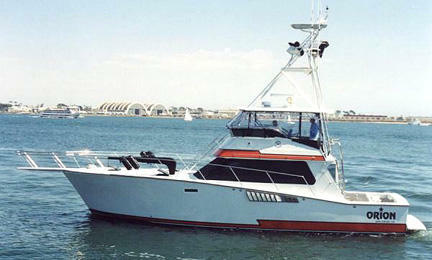 This is a photo of the fiberglass version of this designs ... see CABO 50 for details. Sport fisherman boat plans. This new smaller version is available as a custom design for building in FIBERGLASS or WOOD EPOXY. The interior can be arranged to suit the builders wishes ... EMAIL BRUCE for more information about this new design. 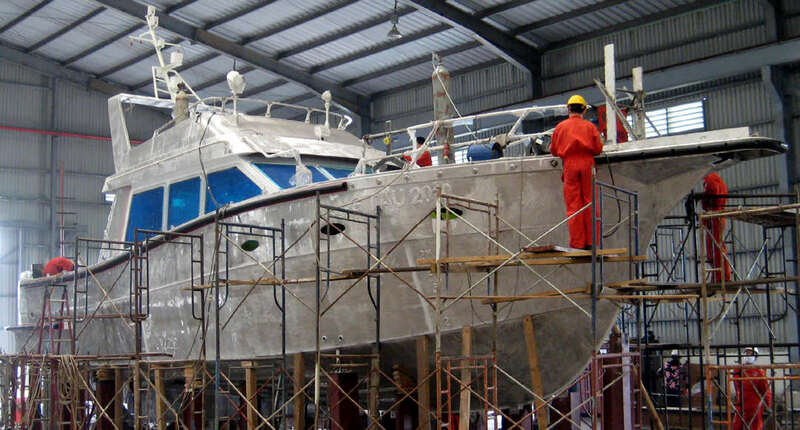 Pre cut boat kits contain all the metal parts required to build a complete hull, decks and superstructure. These parts are computer generated and NC Plasma cut before they are packed and delivered ready for you to start assembling and welding into the finished boat. We design and nest the package using our specialized computer programs, then cut on a computerized plasma-oxygen cutter. 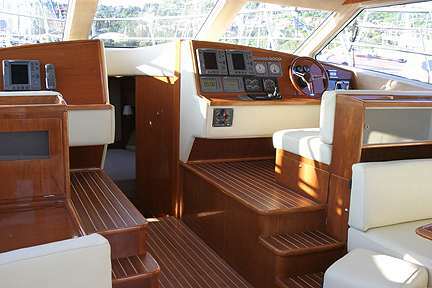 For example, an 12m (40') yacht would comprise of around 550 parts! The parts that need bending or shaping are already pre-formed, all you have to do is weld your kit together. These kits are shipped world-wide each in individual containers. The following power boats are available as kits only. They come with full construction details. We can develop, as kits, most Bruce Roberts hulls, whether displacement, semi-displacement or planing. These are a great way to get on the water in a boat that you have fully customized.